In Mysore, we lived in a building, which was facing the Ashwatha/Peepal-Neem and Navagraha temple for 20 years. The Peepal tree towered over the Neem tree and the Neem tree branches with dense foliage was spread proportionately around the Peepal tree in an embrace. Our favorite play space was always below these trees. 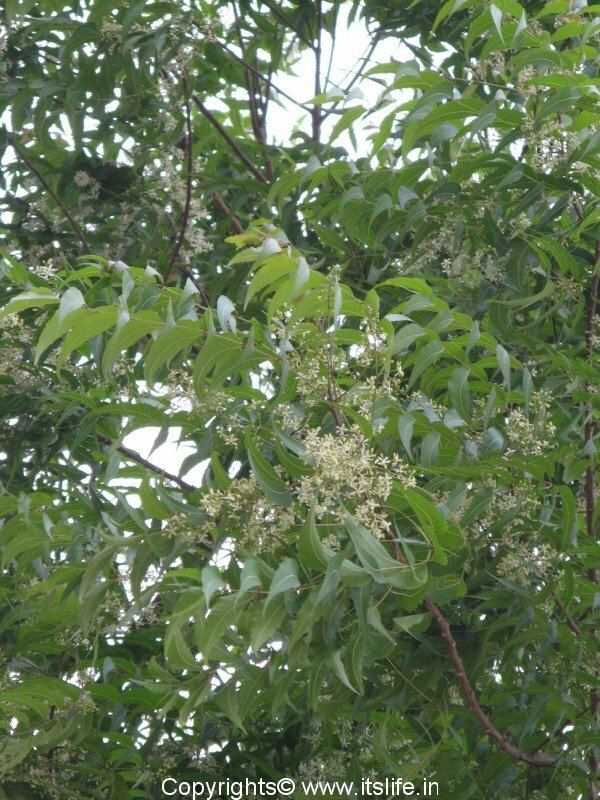 During summers, we would enjoy the soft breeze from the Neem tree, use the Neem flowers and leaves during Ugadi and I remember as a child when I had a severe attack of Chicken pox, a gentle brush with Neem leaves on the skin would relieve the itching. I knew another neighbor who was highly diabetic would grind sprigs of Neem leaves and drink the extract…she believed it would bring down her sugar levels! When we kids used to fall and hurt ourselves, we would immediately crush few Neem leaves and apply on the nick or cut. Neem tree belongs to the Mahogany family Meliaceae*. 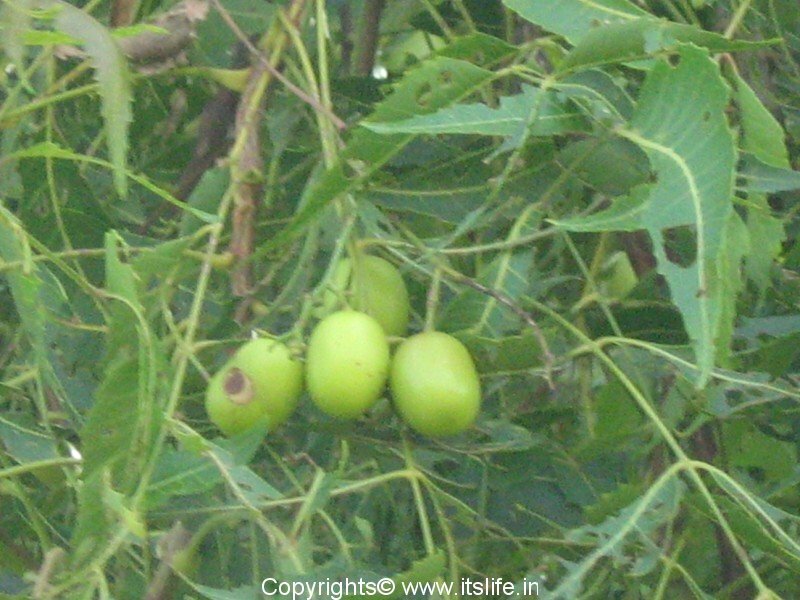 Botanical name of the tree is Azadirachta Indica and in Kannada it is known as “Bevu”. It is native to India, Myanmar, Bangladesh, Sri Lanka and Pakistan growing in tropical and semi-tropical regions. 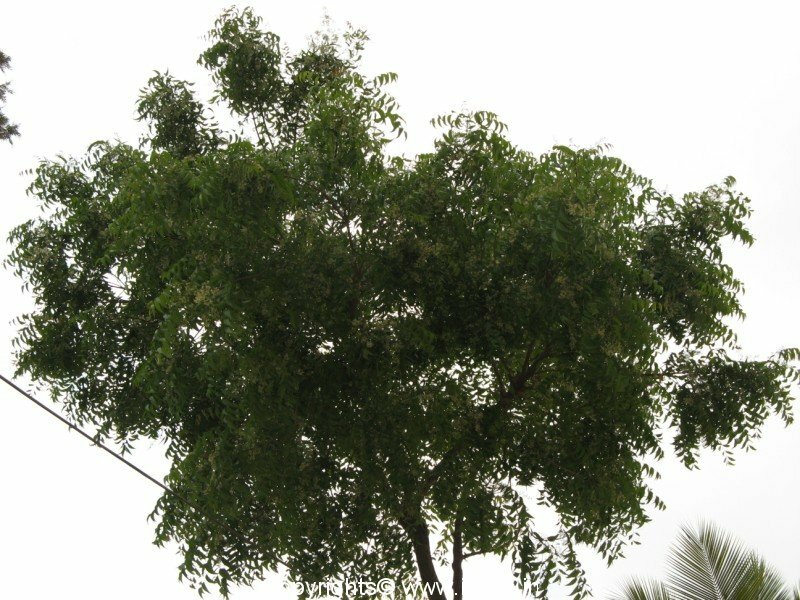 Neem is a fast-growing evergreen tree and reaches to a height of 15-20 meters in its lifetime. The branches are wide spread and the crown diameter grows to around 15 – 20 meters in diameter. Neem leaves are alternate and pinnate about 20 – 40 cm long. The flowers are scented and are grouped in bunches. The flower bunches are about 10 inches long and a single flower is about 5 to 6 mm in size. The Neem fruit is green, oval, bitter and smooth with seeds. 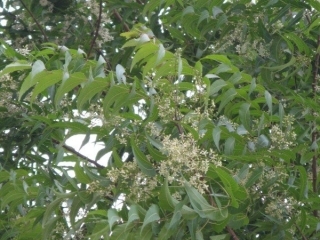 In India Neem tree is found growing everywhere. The tree is considered sacred and is revered because it can cure a variety of diseases. Neem products have a huge market in India. Almost all parts of the tree are used to make cosmetics, tooth paste, pain relief balms or organic insecticide. I have used Neem Oil diluted in water and sprayed on plants as an organic insecticide. This controls pest attacks as well as gives sheen to the leaves. Dry Neem leaves powder when mixed with water and applied on pimples and left overnight, controls the inflammation. Neem flowers and leaves are used on Ugadi/New Year festival in Karnataka. 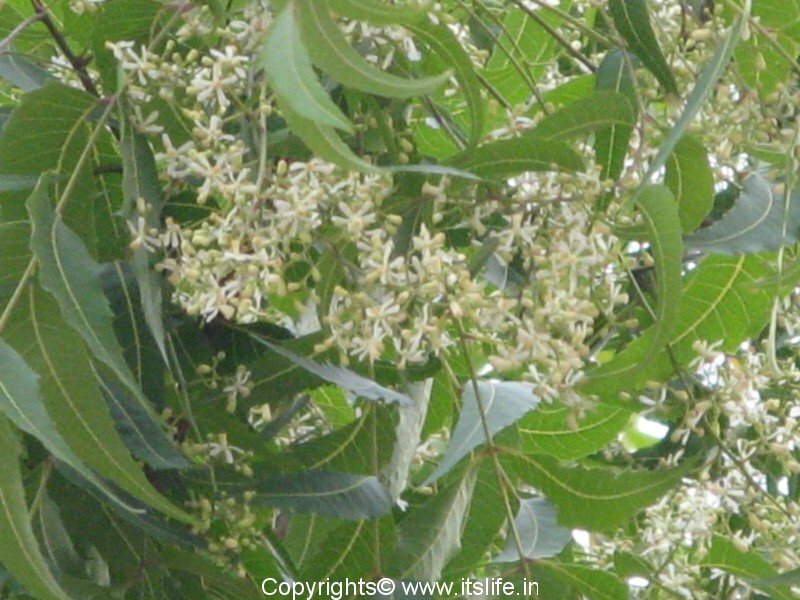 On this day, Neem leaves are hung on the doorway along with thorana/Mango leaves string. The flowers are mixed with Jaggery known as “Bevu Bella” and offered to Gods and each member of the family is given a spoonful of this mixture as prasada/edible gift. This is to remind that life is bittersweet. Meliaceae*, or the Mahogany family, is a family of flowering trees and shrubs. THANKS THIS IS A REMARKABLE TREE! COULD YOU TELL ME HOW MUCH THE SEEDS COST? DO YOU HAVE A SAMPLE OF NEEM CAPSULES? Please write to asanexports@gmail.com and they might reply back with details. We can supply good quality of Neem seeds in bulk quantity with competitive price. Kindly let us know your interest.